The Paris-themed rooms offer an LCD TV and a minibar. Some rooms have a courtyard view and all have a private bathroom. The Republique Metro station is situated just 500 metres from Le 20 Prieuré Hotel. It provides direct access to the Eiffel Tower, Place de la Bastille and the Eurostar terminal at Gare du Nord. This air conditioned room features satellite TV, a minibar, safety deposit box and a telephone. The en suite bathroom includes a hairdryer and free toiletries. Rate: € 89.10 ... € 218.00; select dates below to get current rates. This air conditioned room features satellite TV, a minibar, safety deposit box and a telephone. 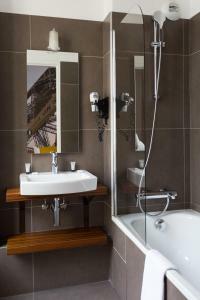 The en suite bathroom includes a hairdryer and free toiletries. Please note that double rooms with balcony are available upon request, subject to availability. Rate: € 109.80 ... € 218.00; select dates below to get current rates. This air conditioned room features satellite TV, a minibar, safety deposit box and a telephone. The en suite bathroom includes a hairdryer and free toiletries. Please note that triple rooms with balcony are available upon request, subject to availability.